Movement is generated by any number of dynamic elements in a picture. Lines, comparative bodies, and structural elements may all work to activate your image. The dominance of one size of object over another will create movement, as will the energy and direction in your lines and the organizing of the parts of your picture. Converging lines and focal points tell the viewer's eyes to move around the picture. A basic visual symbol for movement is a diagonal line, and it is the prime mover in most figurative works. 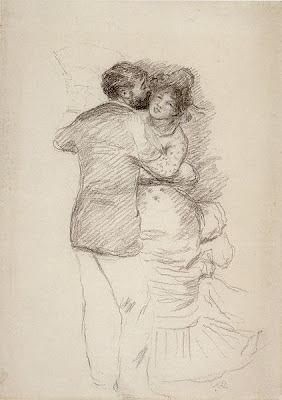 At the right, in Renoir's Study for Dance in the Country, the master artist establishes energetic movement both in the upward diagonal hatching, and by the diagonal lines suggested by Suzanne's head and upper arm. Every angle and tilt of the two figures evokes a movement of the dance, to include twisting and stepping and spinning. Other aspects of the line create movement, such as elliptical lines and arcs. Remember that western eyes read from left to right. Do not cause unintentional visual blocks to movement, such as a right angle line or a tangential line or mass. Look at graphic art and the work of illustrators to understand motion and visual pathways in art. These artists are expert at flagging where they want your eyes to move, stop, and circle around within the image. It is slick salesmanship, and the master artists also used these techniques to their advantage. Henry Toulous-Lautrec places this figure's left elbow against the left edge of the picture plane. This creates an almost mechanical support and we feel the static nature of this, supporting the action of her hand turning her hair braid. The twist in the braid, and the almost right angle of the braid to her head suggests action. The triangular form of both arms held up leads our eyes in the all-important upward and rightward motion. Her nightgown directs us up and into the picture, and establishes multiple directional and diagonal lines. 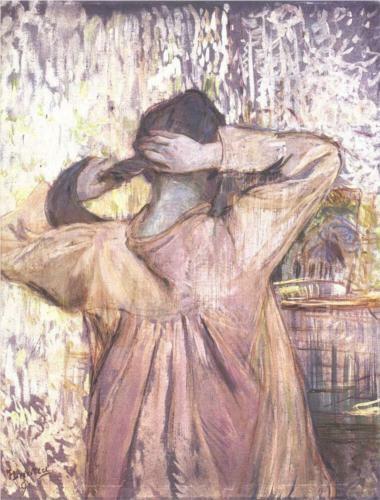 Arcing lines create the sweep of turning motions: note the black hair around the wrist and the right edge of the nightgown at the lower right. By the way, do not miss my upcoming post on visual pathways, because I have some great lessons to share with you on that subject. I think everyone will learn something new. Pierre-Auguste Renoir. Pencil study for Dance in the Country (Aline Charigot and Paul Lhote). 1883. Henri Toulouse-Lautrec (1864-1901) Combing. 1891 Medium not specified/ looks like other oil paintings by the artist. Really nice site! You now have a new follower. I look forward to it Casey. Diagonal compositions came naturally to me. For a long time, they made me nervous. I had to be very careful to make sure that I stopped the eye from going off the page. I wished I had been naturally oriented differently. Now, I would have it no other way. This is a great blog. Thank you for being so giving. Thank you very much, Linda! We'll be talking about keep the eyes on the page. I look forward to your input on that one, too. That will be called Visual Paths and we'll get into letting the viewer in. Thank you, Jon at artfist. Update: looks like the woman dancer in Renoir's drawing is not S. Valadon, but Aline Charigot.